Product Description: Candida albicans is a naturally occurring yeast that typically resides in the gut as part of the normal gut flora. 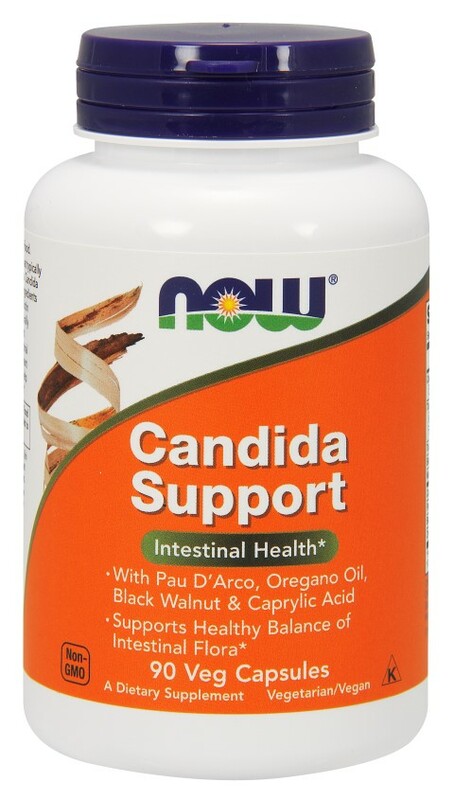 Candida Support is a combination of traditional herbal ingredients (Pau DArco, Black Walnut and Oregano Oil), Biotin (a B-complex vitamin) and Caprylic Acid (a naturally occurring fatty acid derived from plant oils) that may help to support a healthy balance of intestinal bacteria. Although Candida Support is not meant to clear Candida albicans from the gut, it can help to support a healthy balance of intestinal flora. * With Pau DArco, Oregano Oil, Black Walnut & Caprylic Acid Supports Healthy Balance of Intestinal Flora* A Dietary Supplement Vegetarian/Vegan. Suggested Usage: As a dietary supplement, take 2 capsules twice daily with food. Ingredients: Cellulose (capsule), Garlic (bulb), Olive Leaf, Cats Claw Root, Wormwood Herb, Silica, Magnesium Stearate (vegetable source) and Cellulose Powder. Contains tree nut (walnut hulls). Not manufactured with wheat, gluten, soy, milk, egg, fish or shellfish ingredients. Produced in a GMP facility that processes other ingredients containing these allergens. Caution: For adults only. Consult physician if pregnant/nursing, taking medication, or have a medical condition. Keep out of reach of children. Store in a cool, dry place after opening. Please Recycle.